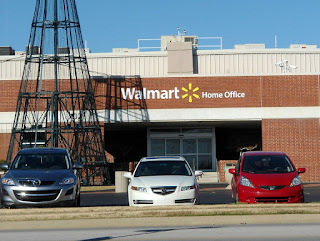 BENTONVILLE, ARKANSAS (The Nil Admirari) - Chain retail giant Walmart announced today it will be closing all of its more than 4,000 stores in the United States to stop its employees from unionizing. Walmart stated a handful of stores were at risk of becoming unionized so it chose "the scorched earth option" to immediately make over 1.3 million associates unemployed. "At Walmart we would much rather shut down all operations than allow any of our ungrateful and overpaid employees to start a union," said Greg Foran, President and CEO, Walmart U.S.
Walmart warned Americans its absence from the market would be highly disruptive and encourage "frightening levels of healthy competition." "Not only will the plague of mom-and-pop shops creep back into the market, but they will offer their employees far better wages," stated Foran. Walmart promised it will return to the U.S. market when Americans "come to their senses." Target announced a short time later the persistent union threat may force it to follow Walmart's example.